For these tarts I used a giant size muffin tin. 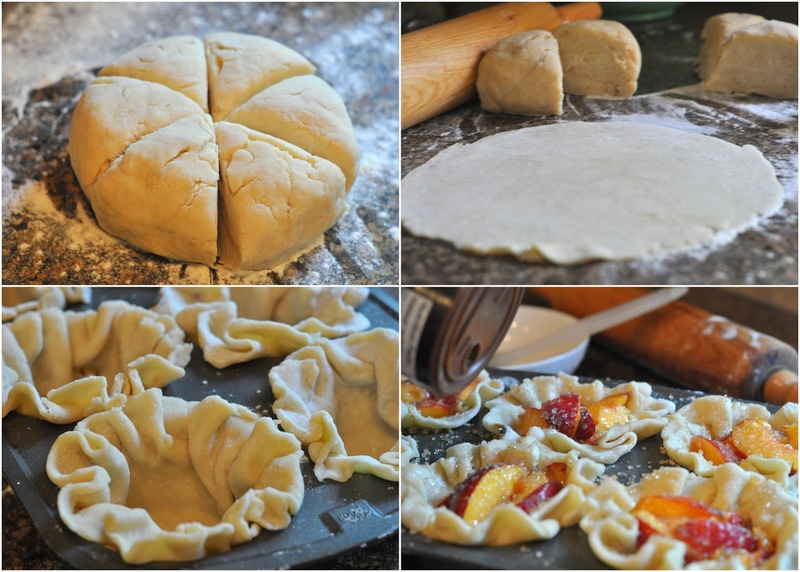 If you do not have one, you can make 12 smaller sized tarts by rolling out the pastry and cutting smaller circles (4.5 inches), or lay them flat on a parchment paper lined baking sheet, putting fruit in the center and folding up the sides like mini pies or galettes. These are delicious dessert served with a light custard or ice cream and easy to assemble. With pastry blender, cut butter/shortening into flour, sugar and salt until it is coarsely crumbled. Sprinkle with combined water and sour cream. Stir with fork until all the dry ingredients are absorbed and you can shape it into a ball. Divide into six to make giant size tarts. Shape each wedge into a circle and roll out to a 6 inch circle on floured surface. Brush inside and tops with egg wash. Combine sugar, flour and minute tapioca, then mix with nectarines. Divide among tarts. Bake at 375 F for 30 minutes. If tops become dark, cover loosely with foil, but be sure to bake until syrup filling bubbles/cooks. Cool for at least 15 minutes before removing to wire rack. These freeze well and can be reheated to serve single servings or a serving to share with a mound of ice cream. In saucepan, bring 3/4 cup cream to almost boiling point. Stir into hot cream in small saucepan and continuing to stir, until it comes to a gentle boil. Add vanilla. oh my! these look super good! what a great recipe thanks for sharing! I want one right now! Can you send one my way? These look perfect Anneliese - yum! Can you use peaches too? Yes, for sure! You just have to peel them.